Strong winds can do a number on roofing systems. If your roof sustains severe storm damage, it might be necessary to invest in a roof replacement. Working with a reputable roofer is key in ensuring your roof is restored to its original condition. 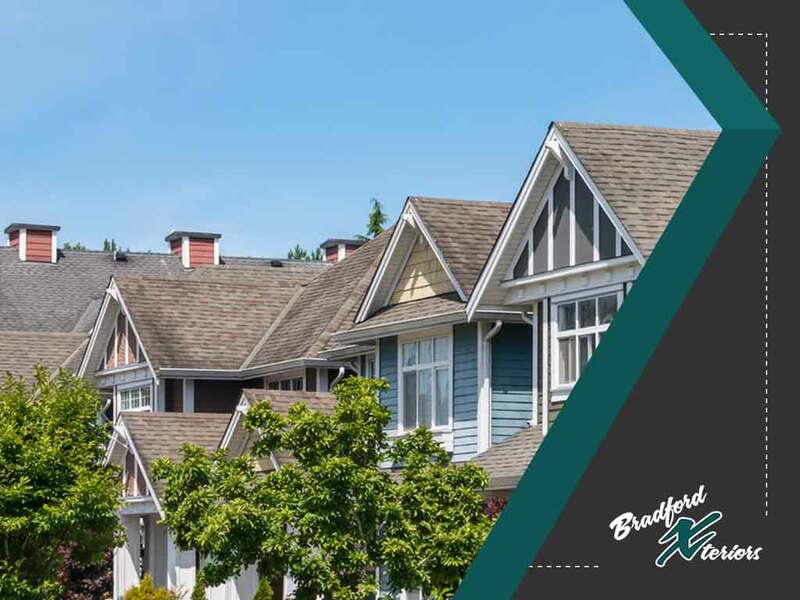 In today’s post, Bradford Xteriors, your local roofing contractor, discusses wind damage on roofs in detail. Here, we focus on the characteristics of wind damage and how it affects roofing systems. We also explain what you need to do to get your roof back in working order. Wind is air that moves from an area of high pressure to an area of low pressure. It happens through a process called convection, causing updrafts and downdrafts that vary in terms of direction, strength, duration and speed. It can happen in both large and small cases, from hurricanes and tornadoes to a gentle breeze. The only thing stopping that breeze from tearing off your old roof and forcing roof replacement is, in fact, magnitude. Geographic features sometimes also create wind events even without a storm present. This is common in mountainous areas, where air is forced out of its natural path by the peaks. Every roofing and siding contractor knows the devastating effects that strong winds can have on homes. So how does this happen? Uplift, or the propensity of materials to be lifted into a wind-created vacuum, is one of the forces that creates damage. This can be brought about by either loss of laminar flow or increase in wind speed. The former refers to a state where air flows close to a surface. Physics dictates that air must maintain contact with the surface. Wind loses laminar flow if the air moves past a curved or bent surface. The wind then separates from it, creating a vacuum, which, if strong enough, can lift anything that moves. An increase in wind speed occurs when the wind blows toward a structure (e.g., your home). Suppose the initial approach speed was ten miles per hour. As wind hits your home, it increases to up to two and a half times said speed, causing reduced air pressure from the air moving fast along your roof. This increases the amount of uplift, tearing off the roof cover that then necessitates immediate roof replacement. Wind damage can be either direct or indirect in nature. Damage is considered direct if the roofing materials have been torn off or have been damaged or misplaced. Indirect wind damage is that caused by wind-blown debris. Known as a “missile,” this debris can be any material carried aloft by a strong gust of wind. It can be pieces of gravel, tree limbs or any other object laying on the ground. Such damage is usually easily noticed, especially when you inspect your home’s siding. The potential for wind damage on the roofing system can also be determined based on the structure’s characteristics. Damage may vary depending on the type of construction. Mobile homes may suffer more extensive roof damage during high wind events than regular homes with a sturdy structure and a roof made of high-quality materials. The shape and slope of the roof also affect wind behavior and potential for damage. A strong wind blowing parallel to the ridge of a gable roof usually moves along the roof surface, making damage less likely to occur. A full hip roof is likely to sustain more damage under the same conditions, because the plane of the roof offers more resistance and thus presents a greater chance for damage. A roof replacement might be necessary in this case. As mentioned, the speed of the wind increases as it passes over the roof, creating uplift that can cause damage. However, gust patterns and air density are additional mitigating factors that influence the amount and nature of the roof damage. Sudden gusts of wind tend to experience a dramatic increase in speed that lasts a few seconds. Such an impact may do more damage than winds with alternating speeds. In addition, cool, dense air can have an effect on the structure’s wind load. The greater it is, the more it is likely to do more damage. After a strong wind occurrence has happened, it is imperative to schedule an inspection with the best roofer in your area. Time is the enemy in terms of wind damage, so quick, decisive action is the best path. Once the storm clears and it’s safe to go outside, walk around your property and assess the damage. Taking photos and videos to document everything for your insurance claims. A good roofer will be able to help you through the insurance claims process in addition to handling the repair work. Before the best roofer in the area arrives at your property, make sure everyone in your family is safe. Steer clear of fallen electric posts and cables as well as those on the verge of collapse. Don’t turn your appliances on—they might be grounded and might cause further harm. Wind damage can jeopardize the performance and longevity of your roofing system. As such, it is important to be aware of your roof’s condition. Conducting regular roof inspections and being proactive about roof repair will save you time, energy and money. Working with the best roofer in the area, Bradford Xteriors, is a great place to start. Our trusted and certified roofing technicians specialize in taking care of any weather damage your roof might have sustained over the years, specifically from wind, hail, snow or ice dams. We have the experience to offer top-notch services, including storm damage repair, full roof replacements, general roof maintenance and insurance claim assistance. Reach out to us after a storm has hit your home and we will conduct a detailed assessment of the damage and help you through the insurance claim process. Apart from roofing services, we offer siding repair and replacement services. Call (614) 328-8188 to get started. You may also fill out our contact form for a free, no-obligation quote. Our service areas include communities surrounding Columbus, OH.